Understanding of the hormonal control of plant development is dependent on the application of appropriate methodological procedures. The independent analytical unit in our laboratory deals with improvement of existing and development of new modern methods of plant hormone analysis, including their extraction, purification, identification, and metabolic profiling. We utilize techniques such as solid phase extraction (SPE), high performance liquid chromatography (HPLC) and two-dimensional –HPLC (2D-HPLC). 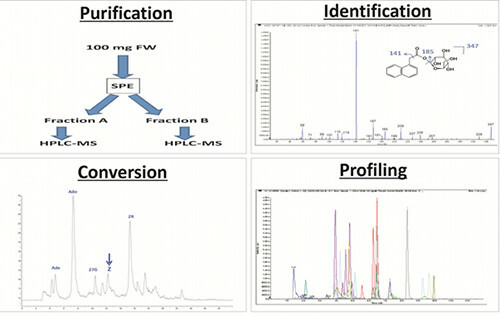 The detection systems in use include the universal UV-VIS and ELSD, on-line radioactivity detection for total metabolite profiling, and mass spectrometry (MS) for selective and sensitive detection of numerous compounds and their unambiguous identification. Fast and efficient method of extraction and purification of several groups of plant hormones and other bioactive compounds from a single plant extract was developed (Dobrev and Kamínek, J.Chrom.A 2002, Dobrev et al., J.Chrom.A 2005, Hoyerová et al., Phytochemistry 2006). The efficiency and relative simplicity of this method led to its quick spreading among plant hormone community as indicates its frequent citation (Dobrev and Kamínek, 2002, prized as „top cited paper“ in J. Chromatography A). Methods were developed and optimized for determination of biological activities of key hormone enzymes catalyzing various metabolic conversions of cytokinins, such as cytokinin oxidase/dehydrogenase (Dobrev a Motyka, Biologické Listy 2003), zeatin reductase (Gaudinova et al., J.Plant Growth Regul. 2005) and cytokinin glucosyltransferase (Polanská et al., Biotechnology Letters 2004) as well as ipt-transferase. The analytical unit also deals with “metabolic profiling” of plant hormones and other bioactive compounds including studies of metabolic fate and dynamics of labeled analytes as well as metabolite identification in plant cells (Mravec et al., Nature 2009; Barbez et al., Nature 2012; Hošek et al., Journal of Experimental Botany 2012). We are able to detect and quantify numerous substances, including the phytohormones auxin, abscissic acid, gibberellins, salicylic acid, jasmonic acid, cytokinins, and many of their precursors and metabolites in single plant sample of minute amount (tens to hundreds milligrams, Djilianov et al., Journal of Plant Growth Regulation 2013; Dobrev and Vankova, Methods in Molecular Biology, 2012; Pinheiro et al., Journal of Experimental Botany 2011).